Youth and adult volunteers interested in improving the local environment and water resources! 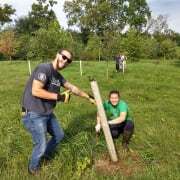 Help with stream side tree plantings, potting tree seedlings, litter clean-ups, rain garden plantings, providing maintenance on previous planting sites, and more. Come to one or more of the many opportunities planned on weekends in spring, early summer, and fall. Respond to this notice to be put on our contact list and be informed of opportunities as they are scheduled. This is a great opportunity for individuals and groups! 1 More opportunity with Penn State Extension - Dauphin Co. Anyone under the age of 18 is welcome but must be accompanied by a parent/guardian or approved chaperone of part of a youth group.